white musk | Scent Addicts - Perfume reviews, fragrance news, & more! I am usually interested in limited edition summer fragrances; I have been pleased by many that I have smelled (most often by those from Escada and Ghost). I was very excited to try Summer Fizz. Mariah Carey has recently announced details regarding the new perfume that she has been working on with Elizabeth Arden. The fragrance is set to be a flirty floral, with notes including the Tahitian Tiare flower, lily of the valley, pink peony, and white musk*. 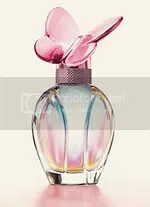 Set to launch in August 2008, the bottle will be the same shape and design of her original fragrance (“M”), but this time with a girly, romantic hue of pink with a mother-of-pearlesque sheen in which blue and yellow will also be present. Interestingly enough, the bottle was not designed by Mariah – it was created by Jean Antretter, the senior design director at Elizabeth Arden. Mariah will have some competition this August, as that is also when fellow songbird Jessica Simpson will release her debut perfume, Fancy, which is an altogether different scent (word has it that Fancy will be a floral-oriental fragrance, which can sometimes be a bit on the stronger/spicier side of scents). 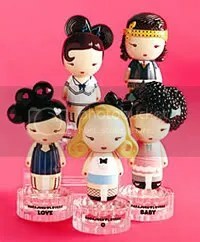 The bottles are two-piece “dolls” that are molded according to their real life Harajuku counterpart, making displaying these on your vanity counter that much more fun.